When I first saw this fashion while archiving photos that I like from the l'Officiel magazines, I knew it was going to become an obsession. A dress made out of two different sized dots! What's not to love? It also looked very Audrey Hepburn to me, even though I have never seen a photo of her wearing a dress like this. 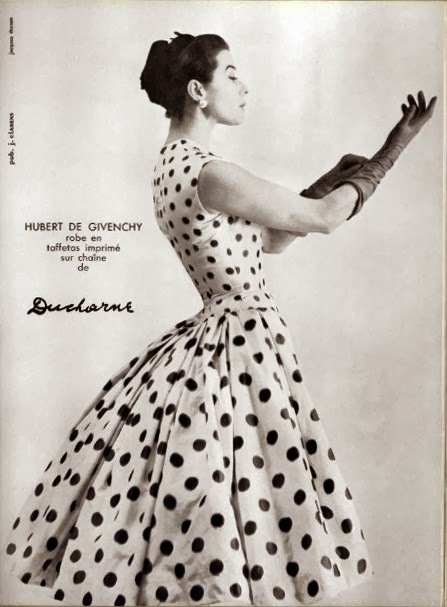 This is not surprising though, because this is a Hubert Givenchy design circa 1955. Givenchy was Audrey's favorite designer. I also found this photo in the same magazine and it became a mission to find the fabrics and figure out how to make that skirt. My ideal would have been crisp silk dotted taffetas made by the same manufacturer. Of course that was impossible, so I ended up using two different cotton fabrics made by two different companies. 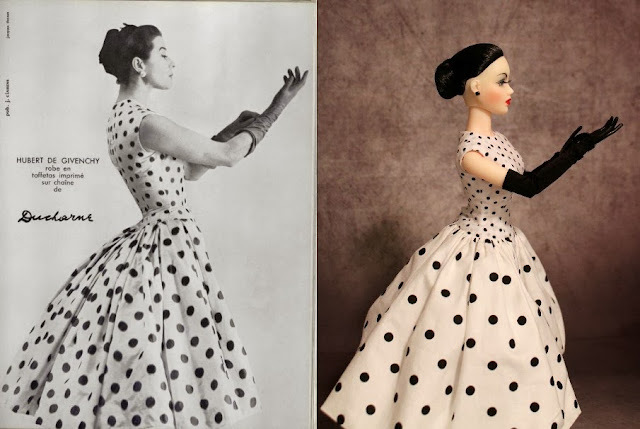 Oh and by the way, doesn't the model look like Audrey Hepburn? I tried to make the skirt look like the original, but it was hard for me to tell how it was made exactly in the photo. In my first attempt I made a princess line bodice and extend the center front of the bodice the length of the dress. When I attached the full skirt to the center front panel it just looked wrong. After several attempts, I decided to make a separate underskirt and have the full overskirt open in the front to show the underskirt. I then attempted to recreate the two photos. This is how I actually took the photo, I flipped it later. My model is the JAMIEshow J'Adore Gene doll. One of these days I will get around to writing a post about these fabulous dolls. I love the wig caps and the "gloves" no more oven mitts! Can you tell I J'Adore her? This is White Orchid in a red wig cap restyled by me. 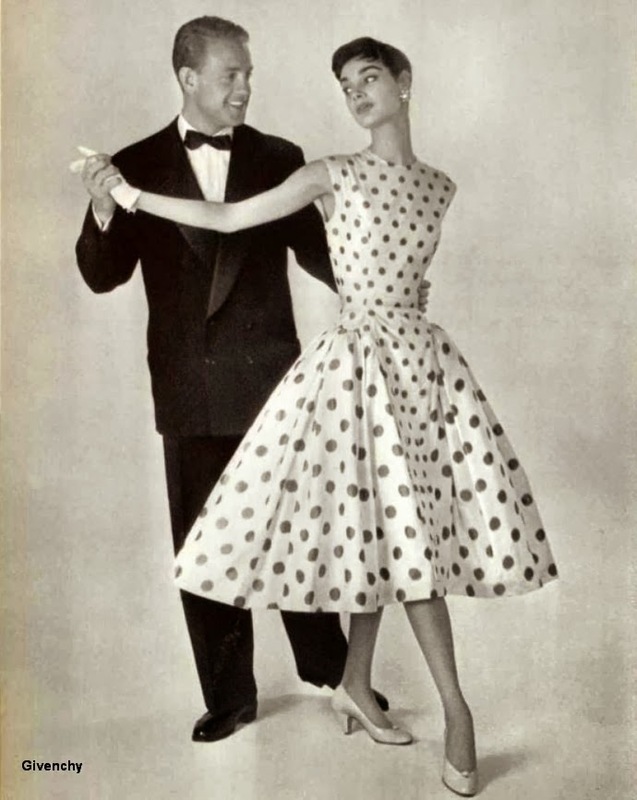 The blue Delft-like print dress is the same bodice as the Givenchy dot dress with a regular skirt. Hat is borrowed from this ensemble. This backdrop makes it look like she is on a Mediterranean holiday. I have had a lot of problems with the lighting while photographing my JAMIEshow Genes. They are made of resin, and literally glow on their own. Adding light while photographing them was washing them out. In these photos I didn't use any extra lighting and I am happier with the results. I still need to work on my photography though. I added extra light to this photo of Poppy Parker, and I am not exactly happy with the results. These dresses look great on the 16" Fashion Teen Poppy Parkers. I made a different bodice to fit the Tonner sized dolls. To buy this pattern click here. You did a terrific job with these dresses. The Givenchy-inspired one is particularly lovely.